The English names for our nearest neighboring planets come from the Romans, who named Jupiter, Saturn, Mars, Venus, and Mercury after their gods and goddesses. So what about Uranus, Neptune, and Pluto? These outer planets were officially classified as planets in 1781, 1846, and 1930. 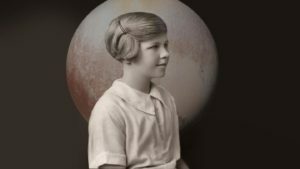 An 11-year-old girl from Oxford, England is credited for naming Pluto. Venetia Burney suggested the name to her grandfather after being inspired by the Roman god of the underworld. Her grandfather, Falconer Madan, was the Librarian of the Bodleian Library of the University of Oxford. Madan passed the name to Herbert Hall Turner, an astronomy professor, and Turner cabled the suggestion to colleagues at the Lowell Observatory. To learn more about how the outer planets were named, click through to this article at Curiousity.com!